I started using Text To Speech on windows when i see it on Opera 10. 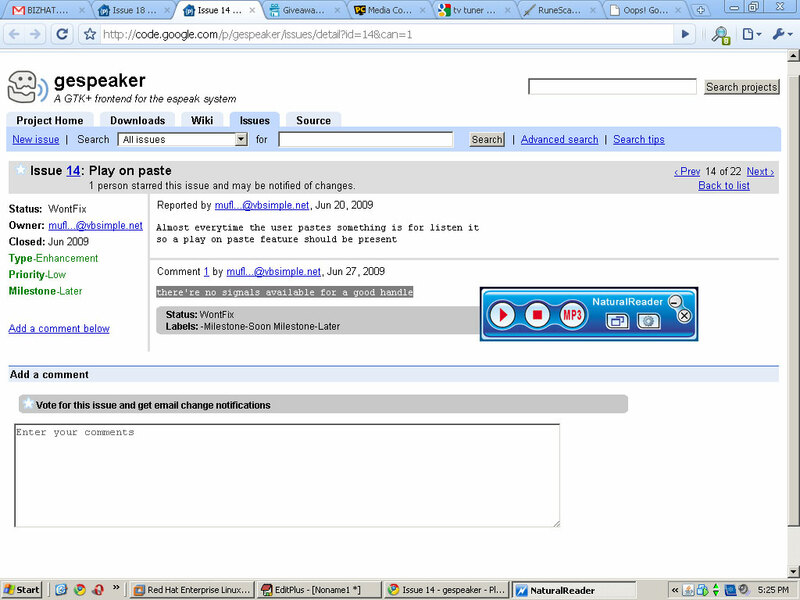 But with latest version of Opera, Speak feature stopped working. It is said that the Speech feature in opera is created by IBM, they no longer support this feature. I have switched from FireFox to opera because of this feature. I have a plan to switch to Ubuntu, one of the reason i still with windows is Text To Speech. I tried few in linux, none of them have good voice quality. After some days of search i decided to go with NaturalReader or TextAloud. Expressivo, IVONA Reader looks good. Both are from same company. They give demo with natural voices too. But i don’t go with that as the voices are not using sapi5. I installed demo, but after seeing it is using their own engine, i removed from the list. TextAloud is very good program. I see many good reviews about that. I have installed trail it work properly. I like the FireFox toolbar provided by TextAloud. Also many more options than NaturalReader. But TextAloud force you to use AT&T voices Mike & Crystal. If you need extra voice that cost $30/$45 per voice. TextAloud give time limited full functional demo with out natural voices, so you have to use it with your system default voice. NaturalReader provide a free version. When the software start, it reads some advertisement. If you purchase paid version, you will get 2 natural voices and the voice advertisement in start removed. Good thing about NaturalReader is you have option to select different voices, even languages. With TextAloud, you are forced to buy AT&T Mike & Crystal voices. There are some bad reviews about NaturalReader. Since i have tried the free version and have option to select voices, i decided to go with NaturalReader Personal. Before purchased i asked sales if the toolbar works with FireFox. They told yes. I asked for demo. They said no demo available for personal version and assured it will work in FireFox. After purchase, i found toolbar not working in FireFox. I asked them why it not working, they told it will work for older version of FireFox (3.5). Current version of FireFox is 3.6. That is not good. They can’t upgrade toolbar for latest version even though they advertise it as a feature. Anyway i am waiting for next release that they told will fix the toolbar. Not sure when it will be released. Even though i was not satisfied with NaturalReader at first because of FireFox issue, it is work money as you only spend price of two natural voices. Consider the software free. Internet Explorer toolbar works better than TextAloud as it highlight words while reading. MiniBoard of NaturalReader is very useful. That is one feature i will miss if i go with TextAloud. But i use FireFox mostly, so prefer a toolbar more than a MiniBoard. MiniBoard will be good to read from non supported applications like Google Chrome.